This is a guest post by Thomas Smale, Founder of FE International. The SaaS business model has enjoyed monumental growth in recent years, and though nearly ubiquitous at the enterprise level—with 73% of organizations expecting nearly all of their apps to be SaaS by 2020—the vast majority of SaaS businesses are owned by hard-working entrepreneurs and are either owner-operated or run by small teams. 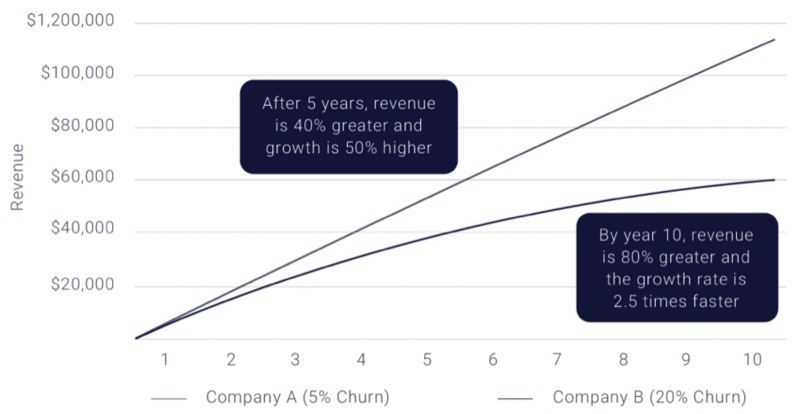 Not surprisingly, the ever-increasing popularity of the SaaS model has resulted in a corresponding rise in demand from investors and buyers attracted to the potential for SaaS businesses to realize predictable, recurring revenue and steady, incremental growth. If you’re the owner of a growing SaaS business, you know what it takes to build it into a successful enterprise—and chances are you’ve wondered how much your business is worth. 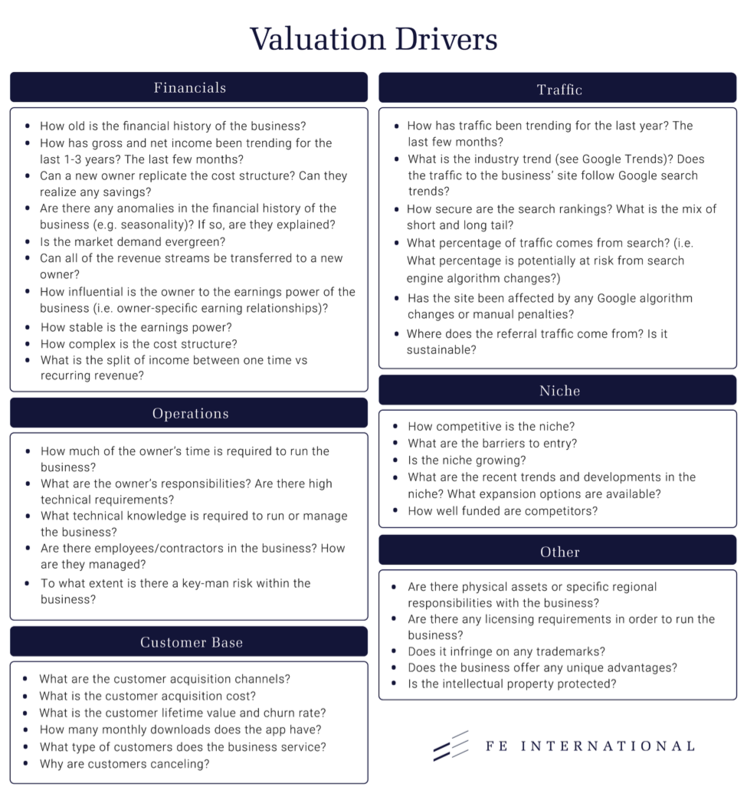 When arriving at an accurate valuation of a given SaaS business, an established M&A advisor will take dozens of factors into consideration in order to take a holistic view of the business. 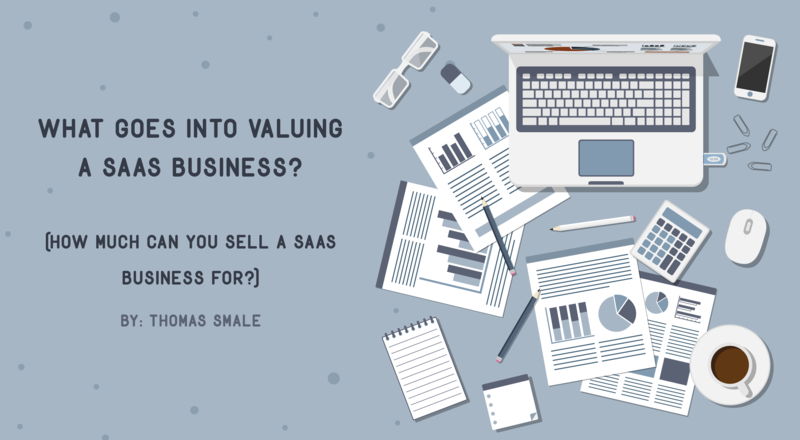 In this piece, we walk through the basics of valuing a SaaS business, with a specific focus on areas where owner intervention can positively impact the value of the business. The first step in arriving at an accurate valuation of a SaaS business is determining the current revenue of the company, which is most commonly done in one of two ways. For SaaS businesses with an estimated valuation of $5M or less, the Seller’s Discretionary Earnings formula is applied. For businesses with an estimated valuation of over $5M, we typically employ the Earnings Before Interest, Depreciation, and Amortization (EBITDA) method. A relatively straightforward method of determining earnings, SDE is calculated by taking the gross revenue of the business, then subtracting any Cost of Goods Sold (COGS) and non-discretionary operating expenses. Then, because many SaaS businesses valued under $5M are owner-operated, the owner’s compensation is “added back” into the final earnings determination. Other acceptable add-backs for the purposes of determining SDE might include discretionary expenses passed through the business for tax purposes, such as travel. Without these “add-backs” the true earning potential of the business may be obscured. The goal of using SDE is to give potential buyers as accurate a picture as possible of current earnings and profitability of the business. Valuations of companies with an estimated value of $5M or higher are more complex and typically use the EBITDA formula. Again, the goal is to arrive at an accurate earnings picture. SaaS businesses valued above the $5M threshold typically are not solely owner-operated, have multiple shareholders, and a management team in place. With EBITDA calculations, any owner compensation and discretionary expenses are subtracted from earnings in order to give a clearer picture of earnings power. Additionally, by discounting expenses like interest and taxes, EBITDA provides an accurate snapshot of the operational efficiency and earnings of a SaaS business. In some circumstances, SDE or EBITDA may not provide an accurate measure of the true earnings potential of a SaaS business. For a fast growing, young SaaS business, EBITDA could come to zero or even less, but the business might still be an attractive acquisition for buyers who are interested in its growth potential. In such cases, it is possible to predict earnings based on projected growth. Such determinations are not without their hazards as they rely solely on growth forecasts that are by nature volatile, and highly subject to change. Revenue multiples are also employed in larger, more strategic acquisitions. Again, the goal is to put large, often one-time, investments in areas such as development into perspective and to uncover the true earnings potential of the business. Finding the most accurate way to determine the earnings power of a SaaS business requires a nuanced approach, sometimes utilizing a combination of all three of the methods outlined above. It is vital to determine an accurate picture of current earnings and future growth potential in order to assess a SaaS business’ attractiveness to buyers. Based on the factors above, amongst others, SaaS business valuations typically fall within the 2.5x to 4.ox of annual profit (SDE) range. Obviously, this is a broad spectrum. If the SDE of your SaaS business is $100K, that’s the difference between a valuation of $250K and $400K. Amount of time the owner is required to spend on the business. Whether the growth of the business is trending upwards or is stagnant. Customer Acquisition Cost (CAC) refers to the resources and monetary investment required to acquire a new customer. Taken in tandem with Customer Lifetime Value (CLTV), CAC is a powerful way of measuring the efficiency of a company’s sales and marketing processes. If CAC exceeds CLTV by a wide margin, this will have an adverse effect both on the valuation multiple and the long-term success of the business. A CLTV/CAC ratio of 3:1 is considered ideal. In order to reach a premium valuation, a SaaS business should aim to achieve a 4:1 ratio of MRR to ARR. MRR is valued at double the rate of revenue derived from lifetime plans. Reduce Customer Churn: Improving onboarding procedures and reducing waiting times for customer support are just two of many ways to reduce churn rate. Outsource/Reduce Owner Involvement: Many buyers are seeking passive income from a SaaS business. Reducing the amount of time an owner must spend on a business through outsourcing and streamlining business processes will lead to a higher valuation. Document Source Code: Code is the backbone of any SaaS. Ensuring that code and documentation follow contemporary coding best practices will increase value, as will documenting the code to make it easily understandable and transferable to a new owner. Safeguard Intellectual Property: Any intellectual property (IP) related to the business, including trademarks, copyrights, and patents, should be duly registered and legally transferable to a new owner. Avoid Discounting and Promotions: While offering discounted annual or lifetime subscriptions may be appealing in the short term, any benefits are likely to be outweighed by the long-term impact on revenue. Marketplace: A popular option—particularly for owners of small SaaS businesses with a valuation of $30K or less—marketplaces such as Bizbuysell have their advantages. Upfront costs to list an online business are low, and the well-established marketplace sites get a considerable amount of traffic. Due partially to the low barrier to entry, there are thousands of websites listed for sale, so it can be a challenge for a business to attract the attention of a well-qualified buyer. While upfront costs may appear negligible, the cost and effort required to vet buyers, conduct due diligence, protect IP through Non-Disclosure Agreements (NDA), prepare contracts, etc. can add up quickly. Even with an NDA in place, there is an element of risk inherent in sharing confidential information with unscreened buyers. For some sellers, the length of time it takes to finalize a sale through a marketplace—typically six to nine months—may also be a concern. Auction: Similar, in principle, to an eBay for online businesses, auction sites share many of the pros and cons of selling on a marketplace site. Auction buyers are often bargain hunting for businesses valued at $5K or below, though there are occasionally successful sales of larger SaaS businesses on the platform. That being said, these platforms bring with them a lack of due diligence into the businesses they list and proper vetting of buyers. For SaaS businesses with a high risk tolerance looking for an independent listing process, selling on an auction or marketplace site can be a good fit. For more established SaaS companies, the increased visibility and low upfront costs these sites offer may come at the expense of undervaluing the business or unspotted discrepancies that can hinder a successful sale. Using an M&A Advisor: Experienced M&A advisors are judicious about which SaaS businesses they represent. Detailed financial records, historical site analytics, and upward trending growth are common prerequisites. Although there is a standard commission of 10-15%, an expert M&A advisor can provide a pre-vetted network of motivated buyers, expert due diligence, and the legal experience to ensure the deal goes smoothly. These and other factors help cut the average sale time down to four to eight weeks for qualified sellers. Moreover, the higher fees are often more than offset by the higher valuation and corresponding sale price that the business achieves, thus most often leading to a higher net profit for sellers than a marketplace. Direct Sales: If you have a proven track record of success in operating and selling SaaS businesses, a direct sale may be a viable option. The seller will be responsible for all legwork such as due diligence, legal documentation, and buyer outreach, so, unlike when using a broker or marketplace, there should be no fees or commissions payable upon successful execution of a sale. However, the expenses accrued due to hiring lawyers, accountants, and other third-party contractors might quickly outweigh any savings in this regard. Additionally, unless you have a network of buyers you trust, you risk exposing valuable information about your company to unscrupulous suitors. Regardless of whether or not you are currently considering an exit, a thorough understanding of how to value a SaaS business creates the opportunity to positively impact the asking price. If you are interested in having an experienced M&A advisor value your SaaS business at no cost and help you determine if the time is right to sell your SaaS business, don’t hesitate to get in touch.